Domes Miramare | Discerning Collection. Hotels, Villas. 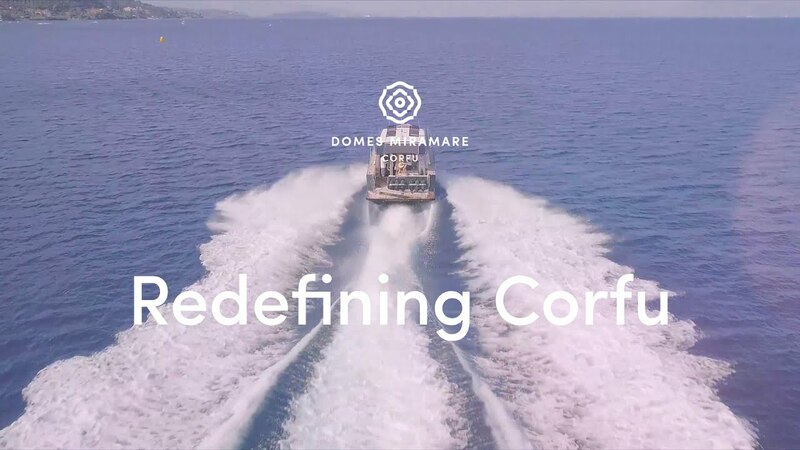 Domes Miramare, the latest addition to the incredible Domes Resort Hotels in Crete, this is a stylish, contemporary adult-only luxury hotel, located on it’s very own beach in Moraitika, on the Eastern side of Corfu. Domes Miramare sits elegantly right on the water front with breathtaking views over the crystal clear Ionian sea towards the mainland. Built amongst age-old olive trees, the 113 sumptuous suites, pavilions and villas are split over separate buildings, many with their own private outdoor pool or Jacuzzi, this hotel really is the definition of contemporary luxury. As with all Domes Hotels, the focus is all about first class, personal service, from fine dining in the Michelin starred restaurants, to pampering beauty treatments and even personal training sessions can be arranged, the team at Domes Miramare will ensure that your stay is truly unforgettable. For the ultimate Domes experience, spoil yourself with upgrading to Haute Living, an exclusive concept for guests staying in some of the higher room categories. Not only is the accommodation the most luxurious, but guests also benefit from many other added extras, including 24/7 access to the Haute Living room, a sumptuous lounge with complimentary magazines, tablets, appetisers and drinks, evening cocktails, a private pool area and direct access to the sea, and a dedicated concierge team. Nearby is the pretty inland village of Benitses, with it’s friendly local tavernas and tranquil setting, and the UNESCO heritage site of Corfu Town is a mere 20 minutes’ drive from the hotel, with it’s picturesque cobbled backstreets, elegant restaurants, shops and buzzing nightlife, it’s well worth a visit. Corfu Town can also be reached by the hotel’s own private luxury boat, as well as exploring the glorious Corfiot coastline. A plentiful buffet breakfast is available from 7-11am every day, there is also an a la carte breakfast menu available. Enjoy traditional Corfiot and Mediterranean fare prepared by Domes Miramare’s Michelin starred chef. Raw Bar serves freshly prepared sushi and cocktails in the evenings, in a stylish and ambient setting. A sophisticated yet relaxed bar with piano music and a wide selection of premium drinks from around the world. This pool bar is by the main swimming pool and serves drinks and light meals throughout the day. Domes Miramare has a fitness studio with cutting edge Technogym equipment. Personal training sessions and yoga can also be arranged. There are also Spa Suites for individuals and couples and a separate room for manicures and pedicures. The team use prestigious brands such as Elemis and Codage Paris. Explore the crystal clear waters of the Ionian on board the Miramaretta, the hotel’s own luxury boat. The concierge team can also arrange a variety of excursions, from visiting local vineyards and olive oil producers to Jeep Safaris and a water sports. Speak to the Discerning Collection team for more information on the Domes Experiences on offer. The Emerald Retreat has a king size bed or twin beds, an en-suite marble bathroom with walk-in shower, and balcony or terrace with garden views. The Emerald Retreat Sea View has a king size bed, an en-suite marble bathroom with walk-in shower, and balcony or terrace with sea views. The Emerald Suite Sea View has a king size bed, a separate lounge area, an en-suite marble bathroom with walk-in shower, and balcony or terrace with garden and sea views. These suites also have an extra WC with walk-in shower and can sleep up to 3 guests. They can also interconnect with an Emerald Retreat to create a 2 bedroomed suite. The Emerald Suite Sea View has a king size bed, a separate lounge area, an en-suite marble bathroom with walk-in shower, and balcony or terrace with beautiful sea views. These suites also have an extra WC with walk-in shower and can sleep up to 3 guests. They can also interconnect with an Emerald Retreat to create a 2 bedroomed suite. The 1 bedroom Emerald Residence has a king size bed, a spacious lounge area, dining area, and fully equipped kitchenette. It also has an en-suite marble bathroom with walk-in shower, and balcony with sea views. These suites also have an extra WC with walk-in shower and can sleep up to 4 guests. The 2 bedroom Emerald Residence has 2 bedrooms with king size beds, a spacious lounge area, dining area, and fully equipped kitchenette. It also has an en-suite marble bathroom with walk-in shower, and balcony with sea views. The residences also have an extra WC with walk-in shower and can sleep up to 6 guests. Guests staying in these room types benefit from all of the extra luxury inclusions. Semi detached single storey building with sea view, large lounge, bedroom with king size or twin beds, marble bathroom with double sinks, bathtub and walk-in shower. The Pavilions also have a large private garden, decked seating area with outdoor Jacuzzi and shower, and have lovely views through the garden out to sea. Semi detached single storey building located on the waterfront, large lounge, bedroom with king size twin bed, marble bathroom with double sinks, bathtub and walk-in shower. The Pavilions also have a large private garden, outdoor shower, and have direct access from the garden into the sea. These suites are semi detached single storey buildings, bedroom with king size bed, and either a separate lounge or open-plan. Marble bathroom with double sinks, bathtub and separate shower. Outside is a large private garden, decked seating area, outside shower, private pool and outdoor Jacuzzi, these suites have views over the lawn through the trees out to sea. These suites sleep up to 3 guests. These suites are semi detached single storey buildings, bedroom with king size bed, and either a separate lounge or open-plan. Marble bathroom with double sinks, bathtub and separate shower. Outside is a large private garden, decked seating area, outside shower, and private pool. These suites are located right on the waterfront with direct access in to the sea. These suites sleep up to 3 guests. The Grand Pavilions are detached single storey buildings, have 2 bedrooms with king size beds, each with en-suite marble bathroom with bathtub and walk-in shower. One bedroom also has a large open-plan lounge area complete with sliding roof, perfect for stargazing from the comfort of your sofa! Outside is a private garden, decked seating area, outside shower, 2 Jacuzzis and a private pool. These pavilions have views over the lawn through the trees out to sea and sleep up to 5 guests. The Grand Pavilions are detached single storey buildings, have 2 bedrooms with king size beds, each with en-suite marble bathroom with bathtub and walk-in shower. One bedroom also has a large open-plan lounge area complete with sliding roof, perfect for stargazing from the comfort of your sofa! Outside is a private garden, decked seating area, outside shower, 2 Jacuzzis and a private pool. These pavilions have uninterrupted sea views and direct access in to the sea from the garden. These pavilions sleep up to 5 guests. Upon arrival, you will receive a special, one-button cell phone. Even though the entire team is at your disposal, whenever you’ll feel like getting in touch with Miramare’s HLS Manager, she or he will be just a click away! We are sure you’re not in a hurry to leave. To help you make the most out of your Miramare experience, by minimizing the time spent on formalities-such as your check out.